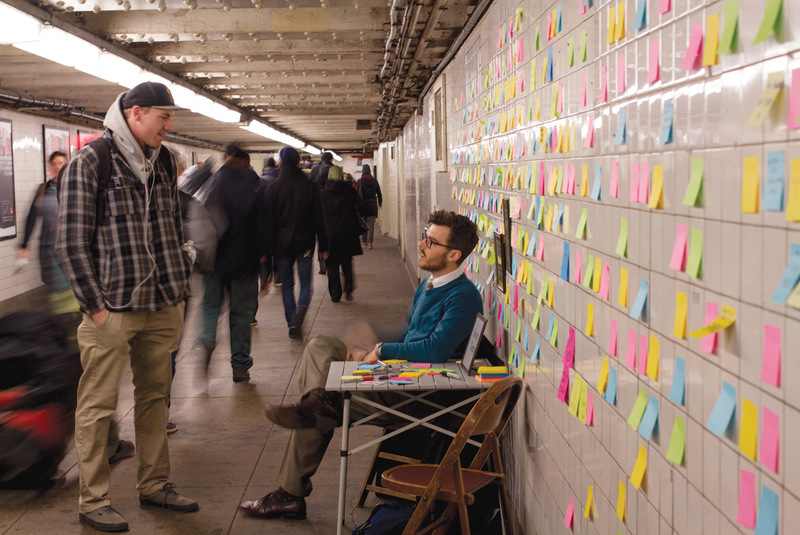 Matthew “Levee” Chavez sits at a table in New York City’s Union Square, sporting a thrift store suit and tie, holding a sign that reads “Subway Therapy.” This act of social practice, which started as an invitation for conversation, went viral after he set up shop at the subway the day after the 2016 presidential election. He wrote “Express Yourself” on a Post-It and stuck it to the tiled wall. By midnight, the wall was papered with 2,000 messages of peace, hope, anger, frustration, confusion and sadness. Chavez, ’13 Creative Arts, had tapped into New York’s communal psyche—using an everyday office supply. As days passed, messages multiplied. 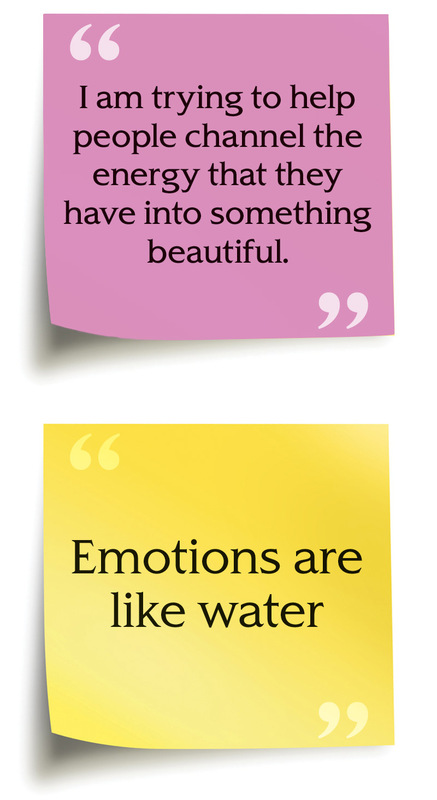 The New York Historical Society archived 5,600 Post-Its. Chavez took some to his apartment, where messages infiltrate his Instagram and influence his work. 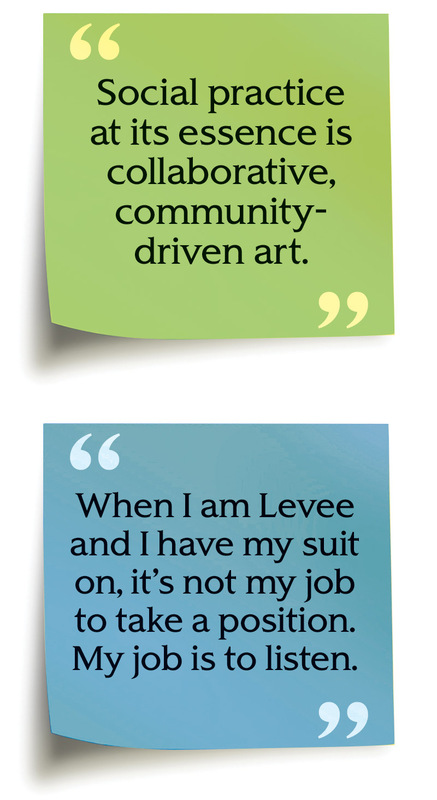 His adopted moniker “Levee” represents the levee he grew up alongside in Gilroy, California, and his desire to help people direct their feelings. Chavez started exploring performance art as public absolution when he moved to New York after teaching in Korea in 2015. He’d had to stay in a Korean hospital while recovering from an accident, giving him time to reflect. 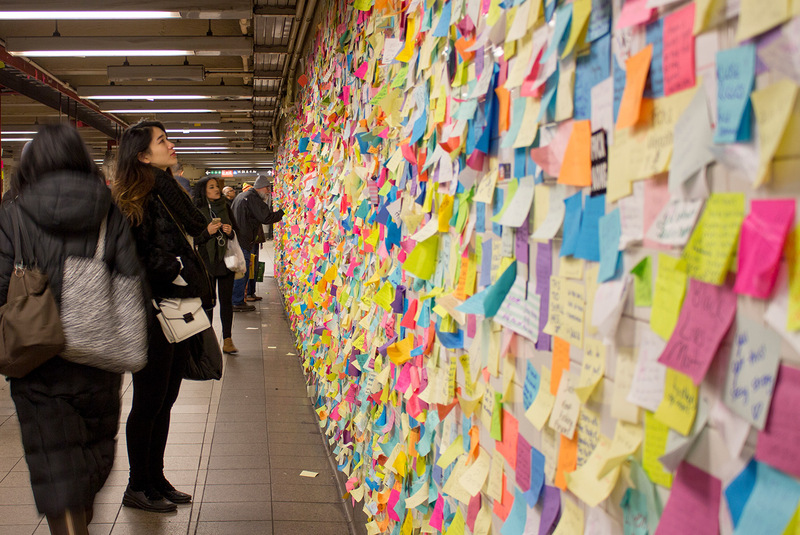 Chavez started by asking strangers to share stories in a notebook he called the Secret Keeper, later transitioning into community “therapist.” Though Subway Therapy gained international acclaim after the election, earning Chavez a two-book contract, he says his work is nonpartisan. Great Post. Thanks For Sharing your Experience with us. Hope everyone benefited. well done. we need to express ourselves.